Korean Dried Zucchini Side Dish that is healthy, delicious and so easy to prepare. Great on Bibimbap and in Fried Rice. Soak dried zucchini (마른 호박 maleun hobak) in warm water for 1 hr. Strain zucchini slices and discard the water. Squeeze excess water from zucchini by squeezing them gently with your hands. 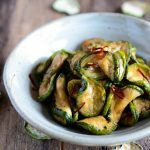 Season rehydrated zucchini with guk kanjang, mirin and salt. Mix seasoning into zucchini by mixing them gently with your hands. Heat a pan with 1 tsp perilla oil (or sesame oil) and saute zucchini on medium heat for 2 min. Add garlic, green onions and 2-3 Tbs water (depending on how dry or wet you like it). There should not be much extra liquid when you are done. Saute for another 3-4 min. until zucchini slices are tender and seasoned. You can also brown it a little by sauteeing on med high heat instead. Taste and adjust seasoning if needed. Sprinkle sesame seeds. Refrigerate any leftovers - it can spoil pretty quickly in the summer. Cooler months, OK for up to 1/2 day. Korean Dried Zucchini side dish can be served both warm and at room temp. Add to Bibimbap or Kimchi Fried Rice for wonderful texture and flavor. Try adding soaked dried zucchini to your Deonjang Jjigae. It’ll be a treat! !